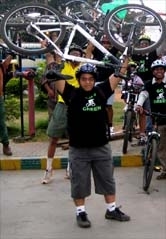 Go Green's Sep 09 CriticalMass (26 Sep 2009) - GGI-Group size: 4000+ Professionals, Increasing on day to day basis, Come & join us 2 serve Mother Nature. Due to Long weekend and few protest going around/near cubbon park has resulted very less turnouts. This time we were 18 of them. Good to see Arun back :) and the route we chose was as below. Jaynagar 4th Block - Jnagar 3rd block - Ashoka Pillar - Lalbagh West gate - Minerva Circle - Town Hall Hudson Circle - Cubbon Park - City Library - Bangalore Press Club - MG Road - Brigade Road - Garuda Mall - Residency Road - Hosur Road - Forum Mall - Taverakera road - BTM layout main Road - Jayadeva flyover - Coffee Day/RIS junction. Ranjani was a first time participant with her brand new (7 days) Firefox runner (hybrid cycle) was checking, for a support vehicle that would be available if she faints or not able to ride. but to our surprise she was riding pretty fast and was always leading the ride. She completed the entire stretch of 23 Km with out any issues. Here is what she has to say after her ride. First of all many thanks for the really exciting experience on Saturday . I have had a joyful, refreshing 3 hours. 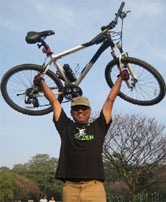 Most of all the team spirit and the responsibility everyone feels for the other team member has impressed upon me . 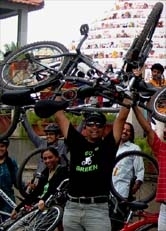 It would be my honor to be a part of the group and spread the message of going green across peers.Cheers.